Are you like me and usually have some ripe bananas in the freezer? Then you’re ready to whip together a summery version of a moist banana bread. With the addition of chia and flax seeds in the batter, it is a nutritious power house with a great crumb texture. 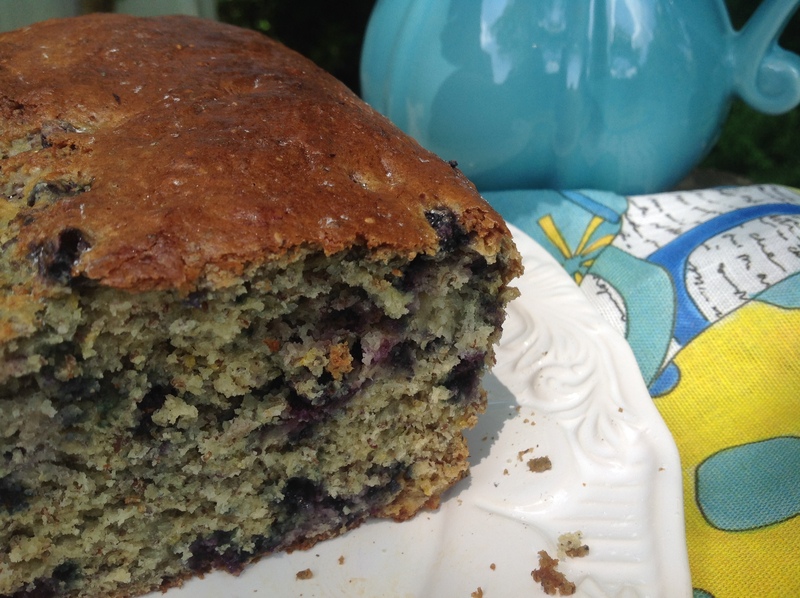 Not too sweet, the banana bread is studded with loads of blueberries and lemon zest giving it a summery twist. I wasn’t sure if mixing blueberries with the bananas would work but hey, I often throw both on my oatmeal and love them together for breakfast so why not? A totally delicious revelation. This is my new favorite banana bread and it comes together in just a few minutes. Yum! Preheat oven to 350F. Spray coat a loaf pan. Whisk together the eggs, oil, bananas and sugar until blended. In a separate bowl, mix the flour, flax seeds, chia seeds, baking powder and baking soda. Add the dry ingredients to the wet and mix only until incorporated. Add the bluberries, lemon zest and lemon juice and gently blend into the batter with a wooden spoon. Transfer to the prepared loaf pan and bake on a middle rack 50 to 60 minutes and a test toothpick inserted in center comes out clean. Let cool 15 minutes before taking out of the pan. 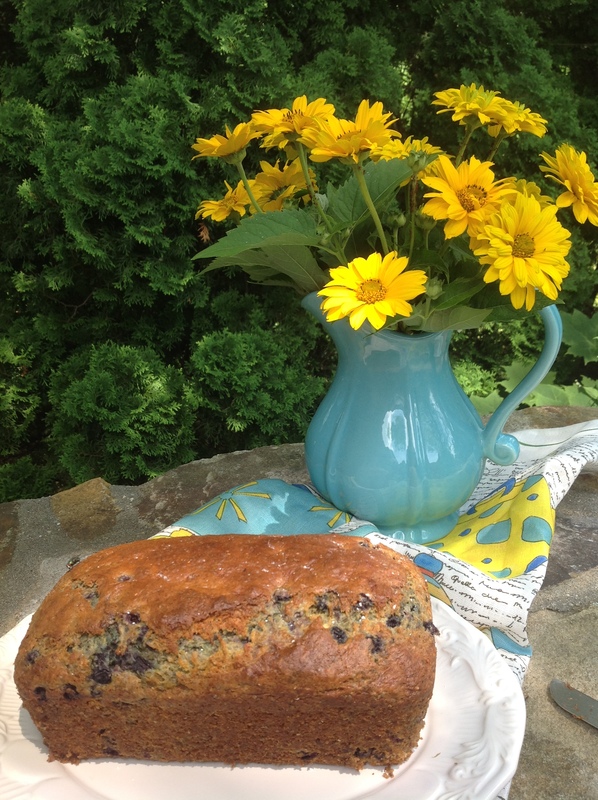 This entry was posted in Recipes and tagged banana bread, blueberry-banana bread, flax and chia seeded banana bread by Johanne Lamarche. Bookmark the permalink. I am so happy you will make this Josette. I found mine needed the full hour to get the middle done. Enjoy! Thank you for the honor Josette! I’m glad your mom liked the bread as well and the tweak with the whole wheat flour makes it even healthier. I really loved the texture of this bread with those seeds too! Is there anything better than homemade bread?! And full of summer blueberries, how delightful Johanne! Thanks Jenna. I love breads of all kinds too! Johanne what a lovely bread! Right now I have a quart of fresh local blueberries in my kitchen and have been trying to decide what to do with them…this recipe is now on the list to make. Hope you are well and stay cool. I think you’ll enjoy this bread Teresa! I am in Northern Canada, gardening zone 1a(!!!) where summers are short but lovely with cool nights. Hope you are staying cool!! I just brought blueberries to add in my healthy salads – you have tempted me away from that idea! What a lovely bread and loaded – it sure is!! Oh no! I am steering you away from your clean eating resolutions! But this has a lot of redeeming healthy appeal so I hope you’ll forgive me Mollie!